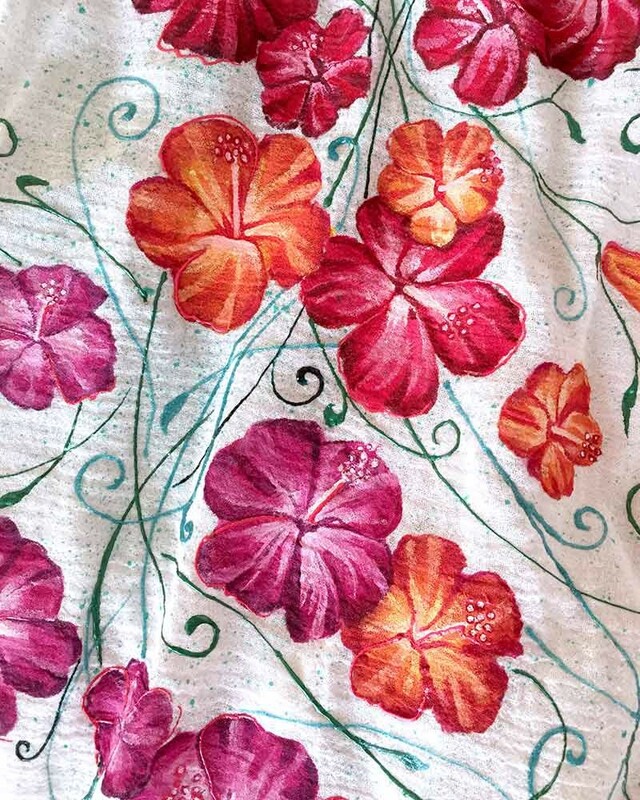 Delicate and spectacular, this hand painted blouse in the fascinating colors is made of white cotton fabric and is decorated with Hibiscus flowers, in shades of red, orange and mauve. The beauty of the exotic flowers is rendered with exquisite care, by hand. The charming combination of shades is painted by artists, using water resistant textile colours and 3D textile color. This unique and spectacular hand painted blouse can be adapted to a trendy outfit, in combination with denim, leather or silk. This sophisticated traditional blouse has long sleeves and is hand painted with textile colours in shades of red, orange and mauve on the highest quality cotton fabric. This fabulous shirt is 100% stitched by hand and is decorated with drawings made entirely by hand, using special colours. The painting is intended exclusively for textile painting and is water resistant and dermatologically tested. Each blouse is unique, therefore some small differences may appear, compared to the model shown in the picture. Hand wash in warm water with mild suds and use moderately warm iron. Do not bleach or tumble dry. To protect the colours, you are advised not to use the iron directly on the blouse. The model can be customized upon request. Estimated time of delivery: 3-8 days.